On Thursday, June 26, there was a rally on the steps of the State House in Trenton to urge New Jersey's elected officials to enact marriage equality in the state. Sponsored by Garden State Equality, Lambda Legal, and the American Civil Liberties Union, a vociferous crowd gathered under the hot sun and heard from advocates and legislators. Afterwards, a press conference was held inside the State House Annex. Below are links to videos of the various remarks. Today’s Supreme Court decision is historic. Lest you think voter suppression is a problem for the Deep South, and not a problem in New Jersey, think again. A lot has been written about today’s Supreme Court decision effectively rescinding Congress’ power under Section 2 of the 15th Amendment. In a conference call this afternoon, Sherrilyn Ifill of the NAACP summarizes today’s decision as follows (audio): Governor Chrisite may not be as blatant about voter suppression as his buddy Ted Cruz, but he’s an acolyte of the GOP line of restricting access to the ballot box. He vetoed an early voting bill, claiming that it would cost too much (even though he concocted another costly voter suppression scheme by holding the Senate vote 20 days prior to his attempt to maintain his power in the State House.) Governor Howard Dean minces no words in describing today’s Supreme Court Decision. And the re-election of Governor Christie will certainly exacerbate the right to vote here in New Jersey as he takes a sharp tack to the extreme right in his quest for the White House. Yesterday, the New Jersey General Assembly passed a bill that would facilitate palliative care for children by allowing them access to certain marijuana-related drugs. The bill next goes to Governor Christie's desk where he will decide whether or not to allow parents to access these drugs in order to ease the pain and suffering of their children. These small kids suffer seizures and other medical conditions and often require expensive hospitalization. The drugs would not cure these symptoms, but would make the little children's lives less unpleasant and do not produce the "high" that is associated with marijuana. After the bill passed, several parents asked for an audience with the Governor, presumably to urge him to sign the legislation. Incredulously, the Governor refused to grant them even a few minutes - instead pawning them off on a staffer. It's difficult to understand the Governor's priorities. He apparently has time to gallivant across the country to promote himself and his education-industrial complex buddies. But he doesn't have the time to meet with parents of New Jersey kids suffering from debilitating diseases. He has the time to be in photo ops celebrating Federal dollars that Senator Menendez and the late Senator Lautenberg secured for hurricane relief, but says the use of medicinal marijuana is a slippery slope to making New Jersey more like California. I don't see the right-wing using the term "compassionate conservative" any more. Perhaps even they can't live with that lie. 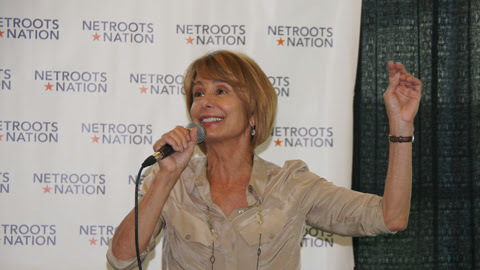 Barbara Buono came to Netroots Nation in San Jose to extend her campaign to a national audience, and she did not disappoint anyone. 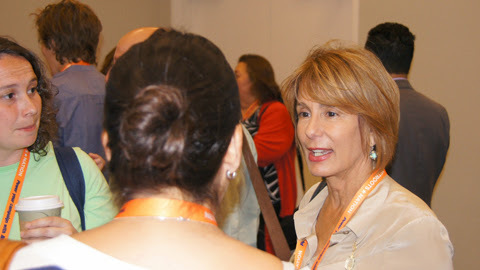 Each year at this conference, there are a few candidates who become rock stars at the event. Last year that included Elizabeth Warren and Tammy Baldwin. This year, it was Barbara Buono's turn. After each appearance, the friendly audience of liberal bloggers and activists lined up to speak with her and have their picture taken. 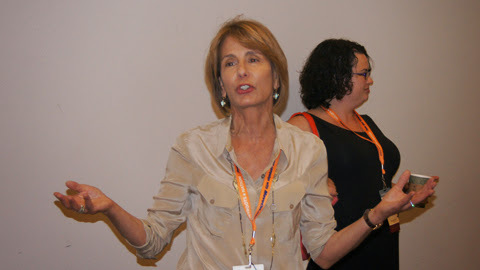 She mingled with a crowd at a reception sponsored by Emily's List, and gave a rousing speech (the best I've seen from her) at a candidate's forum which included other progressive icons like Senator Jeff Merkley and Congressman Keith Ellison. 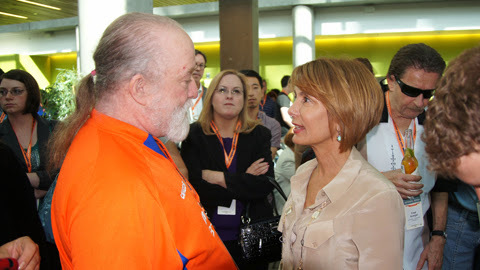 Earlier in the day, I met Buono at a café down the street from the Convention Center. Below is that interview. She talks about her mission at the conference, the special election, the budget, women's issues, and the choosing of a candidate for Lieutenant Governor. 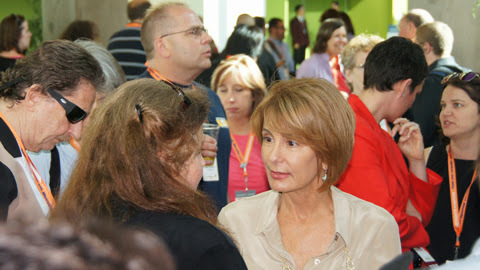 Below the fold: some photos of her interactions with the Netroots crowd. In a column extoling the support that Chris Christie is receiving from certain “Democrats”, Philadelphia Inquirer columnist Matt Katz discusses the reasons why the governor has received accolades. Unsurprisingly, it boils down to money and power. What Katz and the general public fail to see is the wolf in sheep’s clothing. Christie is one of the most astute politicians of our lifetime. He rarely blunders in his quest for political power and influence, and his taxpayer-funded squad of spin doctors is among the best in the business. They say that history repeats itself, and that is becoming apparent in the political ascent of Chris Christie. Christie’s boss won re-election to a second term because the nation was traumatized by the 9/11 disaster. As Katz points out, Christie’s surge in popularity is based primarily on the governor’s handling of another disaster, Hurricane Sandy. This, despite the fact that any chief executive worth his or her salt would have handled similar disasters with compassion and decisiveness. Christie had the added advantage of learning from his bungling of previous natural disaster, “snowmageddon,” during which he took a hands-off approach while he was unsurprisingly out of state. As a result, New Jersey will suffer. Not only because Christie will keep his eye off of the ball locally, but because he will take a sharp tack to the right if he wins a second term. Of course, things would be much worse in a second Christie administration if the Democrats lose control of either or both houses of the legislature. But as we have seen, and as Katz points out, many powerful Democrats are complicit with Christie’s consolidation of power into the hands of unelected officials and the governor’s office. The way New Jersey’s government is set up puts the governor in the driver’s seat. We saw what happened after George W Bush won a second term. The economy tanked and despite the intransigence of the GOP House, President Obama and his team were able to rescue the nation from the brink of financial disaster after Bush went back to Texas. Let’s not be foolish again and give Chris Christie the opportunity to do similar damage to New Jersey.